Tatsumi may have survived his latest battle, but his trials against the Empire are far from over. Following his battle with Esdeath’s Three Beasts, Tatsumi is even more focused on becoming stronger through his mourning of Bulat. Now with the Teigu Incursio, he plans to become stronger than ever. However, when he participates in a government-sanctioned tournament to earn some extra money, he catches the eye of Esdeath and she falls for him, kidnapping him to join her new task force planning to eliminate Night Raid: the Jaegars. Fans of fighting manga, both shounen and seinen, will find something to enjoy in the dark world of Akame ga Kill. Night Raid is still reeling from the death of Bulat in the previous volume. While I appreciated the increased drive the death seemed to give the team, especially Tatsumi, much like Sheele (even more so, actually), very little time was given to dwell on things, which would have been fine if it didn’t make Bulat’s death feel a bit cheapened. He was a primary character, but the story seems to sweep this under the rug. Fortunately, outside of this one issue this volume was substantially better than the previous. While the third volume featured a drawn-out and epic battle for most of its page space, the plot moves more rapidly this time. That being said, the pacing actually seems to work more in this volume because of the well-organized exploration of the new characters introduced. Following the defeat her three servants, Esdeath has wasted no time in forming a new squad of fighters, now called the Jaegars, to take Night Raid on. This makes the previous fight feel a bit inconsequential considering the apparent minimal impact it had on the enemy, but it’s hard to really just consider the Jaegars the villains. After discussing Bulat’s death with the team, Tasumi, Leone, and Lubba go to the capital, and Tatsumi ends up entering a contest of strength to earn some money for his village. However, he makes a fatal mistake: his strength and enthusiasm cause Esdeath to fall in love with him. This is about as amusing as it sounds, considering how twisted and sadistic Esdeath is. 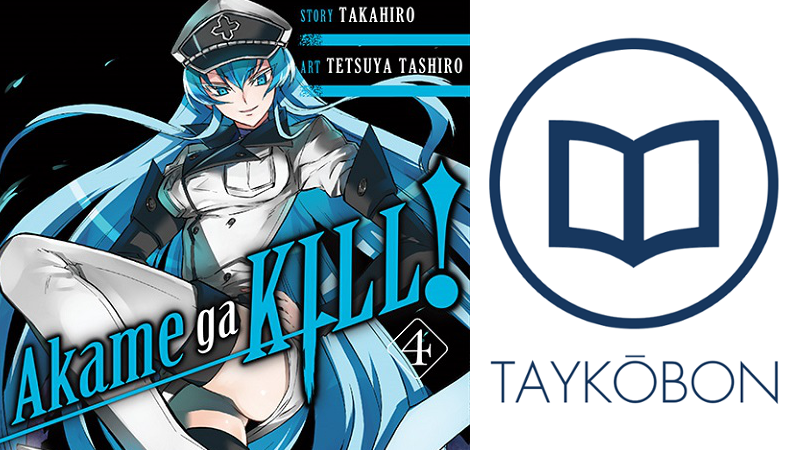 Although Tatsumi being captured by Esdeath to serve as her consort is in and of itself an interesting twist, it is actually indirectly the primary reason why the story works so well this time: since the story is told from the perspective of Tatsumi, the narrative is now given the unique opportunity to explore the Jaegars literally from the inside as Tatsumi is introduced to each member and witnesses their individual power. The Jaegars work quite well for the darker battle type of shounen series Akame ga Kill! is, as they all have interesting abilities and unique personalities to make readers, myself included, interested in them. The group ranges from the hulking and scary Bols (who is actually a sweetheart) to the deadly sweet tooth Kurome to the energetic and very much Tatsumi-like Wave. All of them have Teigu, such as Bols’ flamethrower weapon, and thus they are essentially a Night Raid fighting for the Empire instead of against it. Meeting each of them and seeing them interact with each other really doesn’t make the Jaegars feel like the bad guys, and they certainly don’t think they are considering they are defending the Empire. Another benefit this volume had was how nicely it set up for future stories. Of course, setting up a sympathetic group of antagonists in great in and of itself, but the way it is done works quite well. Details such as Kurome’s previous relationship with Akame as well as Wave’s comradery with his soon-to-be-enemy Tatsumi leave quite a bit of room for emotionally traumatic battles in the future. The volume even manages to end on an interesting but not unwarranted cliffhanger as one of the Jaegars, Doctor Stylish, discovers Night Raid’s lair. Although beginning on a bit of a weak note, Akame ga Kill!’s fourth volume is a very interesting and excellent entry into the series. The introduction of the Jaegars and the intrigue surrounding all the new characters leaves me in a large amount of anticipation for the next volume. If you were worried that the series might take a quality dip with the third volume, your fears will be assuaged with this one. Akame ga Kill! Vol. 4was published by Yen Press on October 27th, 2015. With a story by Takahiro and art by Tetsuya Tashiro, the series is currently ongoing and published by Square Enix in their Gangan Joker imprint. The series received an anime adaptation from White Fox, which ran from July 2014 to December 2014.